Luby’s is a cafeteria-style restaurant known for their home cooking. 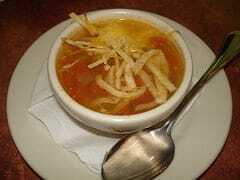 You can try their famous tortilla soup at home with our copy cat recipe. Luby’s Tortilla Soup is a tortilla soup you have to try. Bring broth to a boil in a large pot. Crush tomatoes by hand and, along with juice, add to broth. Add cumin, garlic, salt, pepper, corn, and cheese. Bring to a boil again. Dissolve cornstarch in a cup of cool water in a small bowl. Add to boiling soup slowly while stirring constantly. Let simmer 10 minutes. While soup simmers, saute ground beef in skillet with chopped onion. Drain off any grease. Turn soup off and add cooked beef mixture. Serve with sour cream, shredded cheddar cheese, and tortilla chips.